Attack of the Heirloom Tomatoes! Jasper’s Ristorante hosts an ongoing series of events called Experiences, where Jasper Mirabile, Jr. comes up with a theme and bases a menu around it. This month was “An Heirloom Tomato Experience” featuring Kurlbaum’s Heirloom Tomatoes, a local farm that grows just about every kind of tomato except Killer. 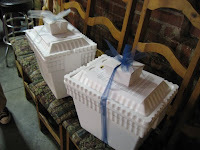 Needless to say, Lunch Blog was very excited to be invited. 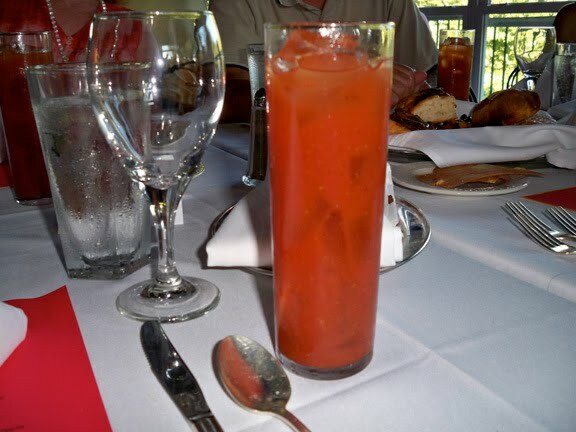 Arriving shortly before 7 p.m., I checked in and was immediately handed a Bloody Mary -- I firmly believe that any experience that begins with somebody handing you a Bloody Mary can’t be too bad. Then I was led to the restaurant’s screened-in back porch, where the Experience would be happening. 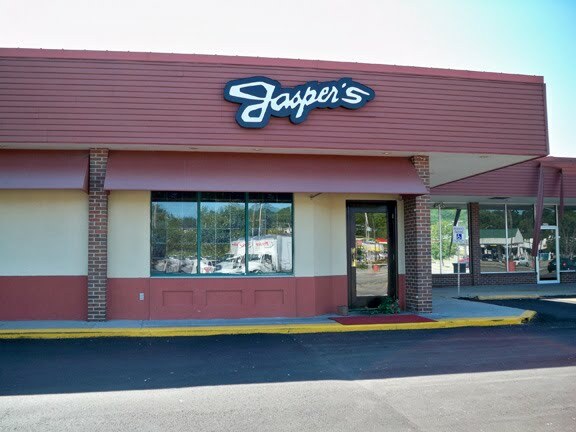 Part of the fun of Chef Jasper’s Experiences is that throughout the evening he gives cooking demonstrations and provides background on dishes, as well as goes off on the occasional tangent. Tonight, along with a couple of people from Kurlbaum’s, Chef Jasper schooled us on the history of heirloom tomatoes. Here’s some Heirloom Tomatoes 101: Heirloom tomatoes are goofy-looking tomatoes grown with seeds that have been cultivated for generations. They come in a ton of varieties and all kinds of tomato flavors, from sweet to smoky to spicy. 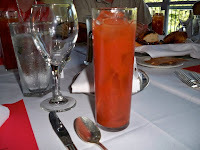 For instance, the tart undertone of my Bloody Mary was courtesy of Arkansas Traveler tomatoes. So we learned about heirloom tomatoes. And then as Chef Jasper prepared a batch of fresh mozzarella, I also learned that I’ve apparently been pronouncing “mozzarella” wrong for my entire life. 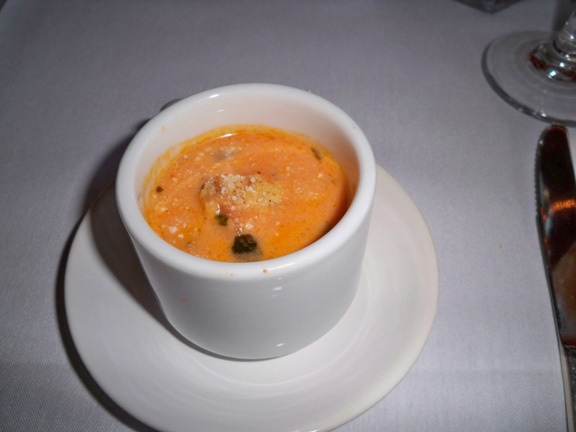 The first dish served was tomato bisque garnished with Shatto Milk Company's Winstead cheese, and it really showed off what’s possible with a top-notch tomato. 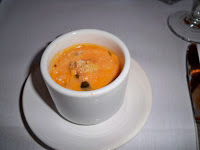 The bisque was soon followed by a Caprese-style salad made with Aunt Ruby’s Green Tomatoes and a slice of Chef Jasper’s mozzarella. 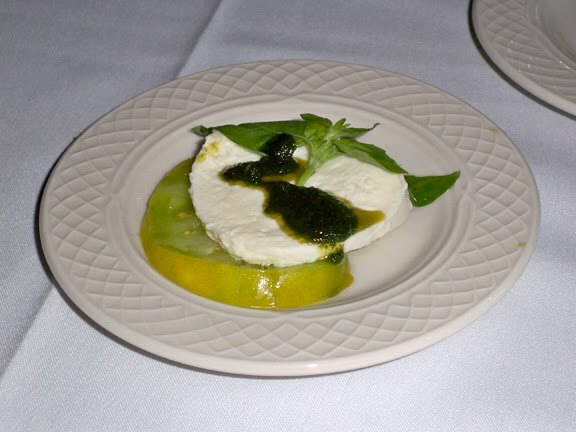 However, instead of basil, the salad had a mint pesto that gave it a refreshing zing. Next was a light but velvety risotto made with Brandywine and Red Zebra tomatoes, after which came Chicken Frederico topped with a sauce that included Cuor di Bue and Pineapple tomatoes. The chicken just about fell off the bone, and was accompanied by artichoke potatoes and a super-fennely sausage. 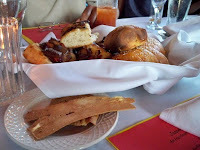 There were also breads and crackers on the table from Meadowlark Acres. 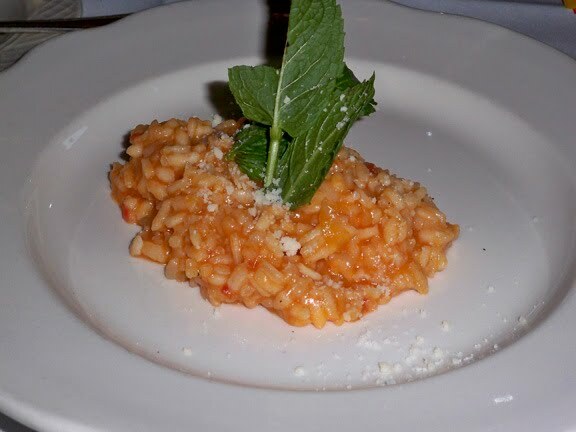 Between the risotto and the chicken, I had a slice of focaccia that was loaded up with tomatoes and caramelized onions. I could’ve almost made a meal off of that alone. 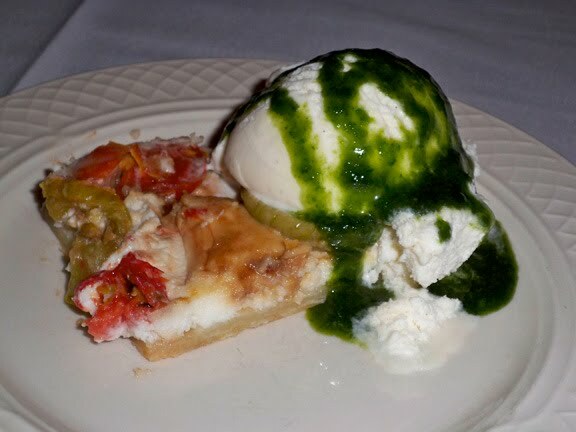 Each course was delicious, but it was dessert that truly ruled -- Jasper Jr.’s Heirloom Tomato & Ricotta Tart with Sweet Basil Cream Gelato. 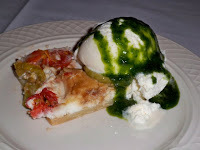 The tart had a flaky, buttery crust, with a body of creamy ricotta that contrasted against the subtle acidity and firmer texture of the heirloom tomato varieties on top. The sweet basil cream on the vanilla gelato was ridiculously awesome, too. Fresh and intense. One of the people seated nearby was at a neighboring table catching up with a friend when dessert was served, and I was pretty tempted to swipe her plate. 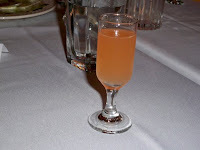 After five courses and some excellent conversation with my fellow diners, it looked like we’d reached the conclusion of the Experience, but not before we were given a final drink of Peachello. Kind of like the Bloody Mary earlier, I now firmly believe you can’t go wrong with any experience that ends with somebody bringing you Peachello. Thanks again to Chef Jasper for the invitation. Seating at all Experiences is limited, and the cost is $45 (tax and gratuity extra). For more info, check out jasperskc.com. 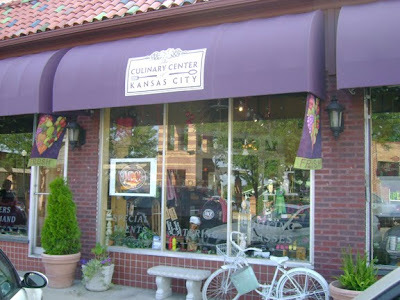 What You're Missing KC!, plus the recipe for Peachello. The Blue Bell doth toll for us. Your Lunch Bloggers were invited by Blue Bell Ice Cream to join them at The Culinary Center of Kansas City for Staff Lunch and an ice cream tasting last week. Held every Tuesday, Staff Lunch is when The Culinary Center opens its doors to the public, and the chefs there make whatever they’re in the mood for. 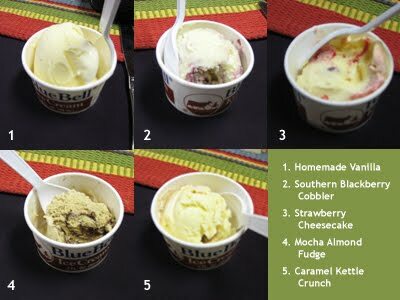 And since by “ice cream tasting,” what Blue Bell really meant was “five full scoops of ice cream,” it’s a good thing that today The Culinary Center’s chefs felt like making a salad. Fine. 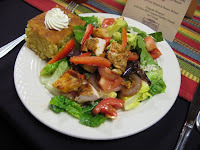 It was a monster Cobb salad with lots of avocado, hard-boiled egg and barbecue chicken, plus chili-lime ranch dressing. Fine. There was also a big hunk of super-tasty jalapeno cornbread with honey butter. It was still a salad, and it was mighty delicious. After that, it was ice cream time. Here’s what we got to try. Homemade Vanilla: Considering this is neither chocolate nor are there chunks in it, I truly don’t understand how it’s Blue Bell’s #1 selling flavor. Still, as vanilla goes, not bad. Southern Blackberry Cobbler: My favorite part of pie is the crust. This flavor of ice cream has pieces of pie crust in it. Good stuff. Strawberry Cheesecake: When it comes to cheesecake, I think I prefer actual cheesecake. Mocha Almond Fudge: Chocolate plus coffee, and thus easily my favorite. Very rich. Caramel Kettle Crunch: Vanilla with a ribbon of caramel sauce and crunchy caramel-coated popcorn. Because we all have to have dreams, apparently Blue Bell has been trying to figure out how to successfully infuse popcorn with ice cream for a while now -- mission accomplished. This is just the right amount of sweet, and if you get a bite with one of the bigger pieces of popcorn in it, you are a winner. To keep it cold, the ice cream was packed with dry ice. Don’t think for even a second that as soon as I got home I didn’t put that dry ice in the sink and try to give my kitchen an awesome rock show fog. Because I did. Like a sucker, I split the brownie with my wife later that night. 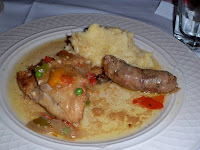 The plating in the picture is mine own -- the ones served to lunchers at The Culinary Center looked much fancier. It was a pretty phenomenal brownie, sweet and a little spicy. 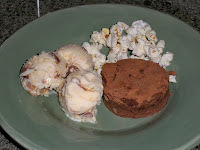 Totally crave-worthy -- one week later, and I’m in serious need of another chipotle brownie fix. In the meantime, I’ve got a spoon and a half-gallon of Caramel Kettle Crunch. Now all I need is a cable movie marathon. I’m hoping for Rocky. 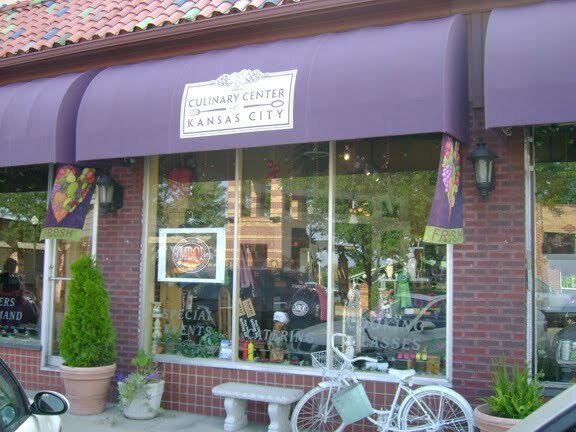 Staff Lunch at The Culinary Center of Kansas City is on Tuesdays from 11:30 a.m. until either the food runs out or 1:30 p.m. It’s $12 and the menu varies week to week. Big thanks to Blue Bell Ice Cream for the invitation.